Gluten-Free Chocolate Magic Custard Cake is seriously a magical treat. You will think that the batter is too thin, and maybe you will blame the recipe but please trust me and put that liquid like batter into the oven and bake it. You will be amazed when you see a 3-layer chocolate cake as a result. And you might even feel like an illusionist and maybe you will call your oven “magic box”. That’s how I feel and do whenever I make magic custard cake. I’ve already made two versions of magic custard cake and it has become a kind of obsession for me. I love the baking process as much as eating this divine cake. The first version was Zesty Magic Custard Cake and we loved the zesty flavor and how light it was. Then I started to think of making the chocolate version of it. Chocolate Magic Custard Cake definitely took it to the next level. 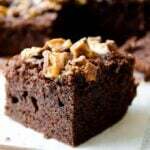 It is one of our favorite chocolate cakes because it is easy, decadent and very chocolaty with a silky center. I’ve made it several times since then using different kinds of cocoa powder. Some resulted in very dark color and some gives a nice brown color, which I like better. 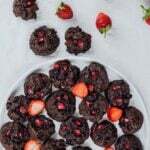 The chocolate version has become so popular among you, our lovely readers and we’ve received several emails asking for the gluten-free version of it. Well, that was something in my mind as well. I was wondering if I could achieve a similar result with a gluten-free substitute. And that’s how this Gluten-Free Chocolate Magic Custard Cake came out. I think this one looks way better than the original chocolate magic custard cake in terms of texture. The layers are more clear and one might think that this cake is made in three steps. Well, you know this is where the magic lies. The taste of this Gluten-Free Chocolate Magic Custard Cake is no different from the original version. I used rice flour instead of all-purpose flour and noone can tell the difference between these in this cake. As the batter of magic custard cake is really runny, I was doubtful about the amount of rice flour. To avoid any failure, I just increased the amount a bit so that the batter holds well when baked. And I ended up with this fantastic magic custard cake. Unlike the original chocolate version, I didn’t dust this one with powdered sugar. I just wanted to leave that nice brown color and top the squares with strawberries instead to make it perfect for spring. You can use any seasonal berry you like. You can even serve this Gluten-Free Chocolate Magic Custard Cake with vanilla ice cream. To make a perfect magic custard cake, please keep the following tips in mind. Separating eggs is easier when they are cold, so separate them first and then let them reach at room temperature. Temperatures of the ingredients are very important in this recipe otherwise eggs will cook if you use hot milk or melted butter and this is definitely not something we want. So melt the butter at the beginning and let it reach room temperature as you are preparing other ingredients. Use lukewarm milk, so heat it a bit. Just test it with your finger. If it is warm but not burning your finger, it’s great. Add it into the mixture gradually and I recommend you to mix it with a spatula otherwise it will cause a big mess in the kitchen since the batter is very thin. Sprinkle a pinch of salt to egg whites and then whip. This will result in wonderful peaks. Add the whipped egg whites into the batter in 3 or 4 parts, stirring with a spatula just until there are no big chunks. Don’t overmix. Don’t worry about the almost liquid like batter. It will bake fine. I bake mine 60 minutes at 325F, but it might be different for your oven. So you might need to test it a few times to decide on the best duration for your oven. When it’s done, it will still be jiggling a bit. This will be gone as the cake cools down. And it will be completely set after it is chilled at least for an hour before slicing. An amazing three layered chocolate cake that is gluten-free. This cake really makes the magic! Preheat the oven to 325F. Grease a 8 x 8 inches baking dish and line it with parchment paper. Melt the butter and put it aside. Let it cool a bit. Whip the egg whites with salt to stiff peaks. Set aside. In a separate bowl, beat the egg yolks with sugar and vanilla extract. Add in melted butter and beat until creamy, about 1-2 minutes. Combine rice flour and cocoa powder in another bowl and sift it into the batter. Mix with a spatula until combined well. Gradually add in the milk and mix well. Fold in the egg whites in 3 or 4 parts stirring gently until no big chunks left. Don’t overmix. Pour the batter into the baking dish and bake for 60 minutes. Let it cool down and chill at least for an hour before slicing. Top with strawberries when serving. Mmmmm… sounds & looks amazing! Since two in my family are also dairy-free, I’m going to try this recipe with coconut oil & coconut (or almond) milk. I’ll let you know how it turns out. Thank you! Hi Aly! Would love to hear your result. Cheers! I’m sorry it didn’t come out good. Not sure what might be the problem. I’ve made it several times and never had an eggy result. We have a video on Chocolate Magic Custard Cake. It is not gluten-free but the recipes are very similar. It might give you an idea. Sorry again. This looks amazing! I love chocolate but was wondering if you know how to make this same recipe but vanilla instead. I love custardy desserts. This custardy cake looks amazing! It’s going on my must try list. The title of this post alone stopped me in my scrolling tracks… but your photos?? Simply spectacular!! Amazing recipe.